The tale of a rural man, who is exploited by political opportunists upon the discovery that he is descended from Genghis Khan, is as thoughtful and spectacular as we have any right to expect from the director of The End Of St. Petersburg. It is 1918. An elderly Mongol lies gravely ill in his yurt while a lama says prayers in an attempt to aid his recovery. His son prepares to go to the market in his place to sell his father’s season’s trapping, including a very valuable fox pelt. On leaving, the avaricious lama tries to take the valuable skin and, in the resulting scuffle, drops a talisman. This is found by the superstitious mother who gives it to her son as a lucky charm as he leaves to trade the furs. The western fur traders at the market are protected by the British troops who are occupying the area to protect foreign interests during the disturbances caused by the post-revolutionary civil war. Taking advantage of the inhabitants’ near-poverty, the capitalist fur trader offers only a pittance for the silver fox and a brawl ensues which leads to the son having to escape across the steppe to the mountains where he encounters and joins the partisans. Two years later he is caught and forced to surrender his belongings. On recognising the word ‘Moscow’, he is summarily sentenced to be shot. While being taken to his death, a missionary translates the characters found on the silk in which the talisman is wrapped; this confirms the young man as a direct descendant of Genghis Khan. Although severely wounded, he is still alive after the ‘execution’ which had been carried out reluctantly. The General decides that, as Genghis Khan is still held in high esteem in the area, his ‘descendant’ should be saved and made the puppet ruler. This is a political blunder of major proportions as the local chiefs not only offer him their veneration but also the services of their fighting men. With his new position of power he transforms into a revolutionary and, with the aid of these forces, clears the landscape of both the exploiters and occupiers in a breathtaking climax. This beautifully constructed and photographed revolutionary melodrama has been justifiable described as an ”epic poem” by many critics. Pudovkin’s films, which include Mother and The End Of St Petersburg, place him alongside Eisenstein, Vertov and Dovzhenko in the forefront of Soviet filmmaking. This film was the first to be made in Mongolia and gives an excellent documentary insight into life on the steppe. Their inhabitants can trace their lineage back through many centuries to the warriors who, with Genghis Khan and his four sons, conquered the area from Mongolia to the Dnieper. 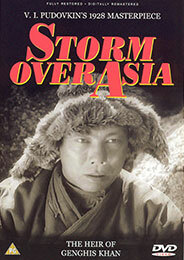 The leading role was played by Valeri Inkizhinov (a Mongol and fellow student of Pudovkin at the State Film School) who, on returning to Mongolia, led the company into his homeland. His father in the film was played by his own father, at the location where he had always lived. The power of the drama is enhanced by the use of visual metaphors, superb editing and the stunning landscape. This version is complemented by Timothy Brock’s original score, performed by the Olympia Chamber Orchestra.